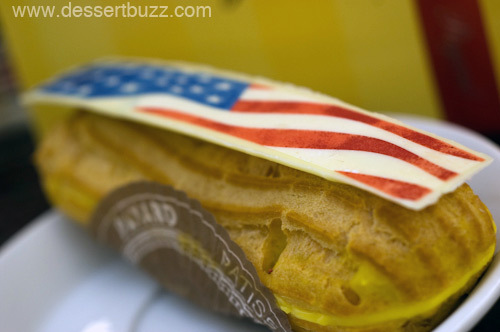 Eclairs: delicious fancy French pastry or dressed up creme puff? 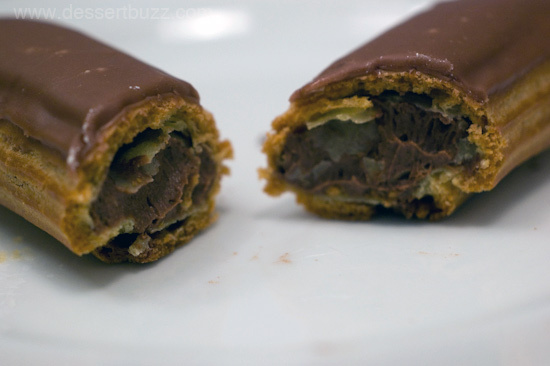 Eclairs represent an odd segment of the dessert category in the US. Even though the best ones are coveted by pastry enthusiasts and sold in the fanciest French patisseries, they are also found along with their cousin, the cream puff, in the frozen section in supermarkets and even in Walmart (! 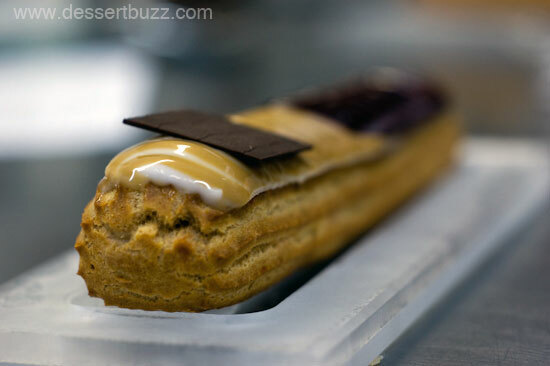 )I’m going to assume that if you’re reading a dessert blog, you’re probably more interested in learning about the eclair as a “fancy French pastry”. But before reading about my favorites, I thought it would be useful to get some professional guidance. Francois Payard Bakery and Francois Chocolate Bar – Notes: The thinnest and lightest crust out of this group, an almost runny, custard-based pastry creme. 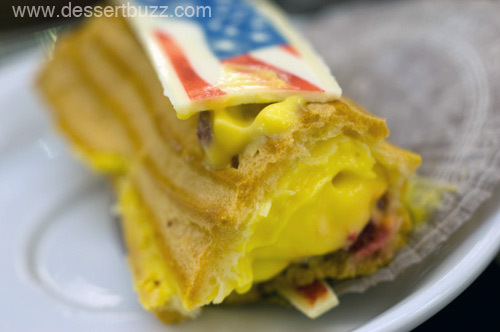 The eclair pictured below had tart raspberries and passionfruit inside along with a white chocolate American flag on top. $4.00 at FPB. I’d imagine the professor would have overlooked the flatter and less cigar-like shape since the choux was so expertly executed. 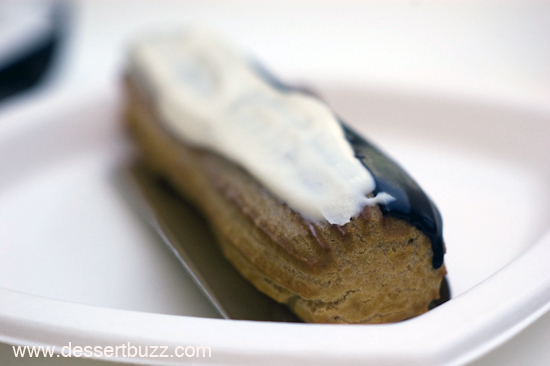 Epicerie Boulud – Notes: A thicker and a slightly tougher choux dough than the others. The filling is also much thicker and heavier–even at room temperature. The filling has a deep, rich, chocolaty taste. The frosting has a matte finish as opposed to the glacage-style, mirror finish of Chikalicious and DAB eclairs. $5.00. I’m guessing a straight “A” for Boulud since it’s uniformly tubular and heavy with filling like the professor outlines. 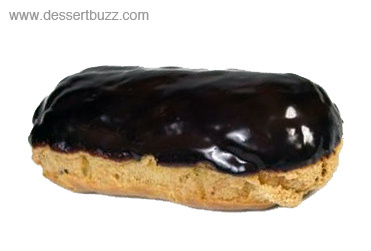 Interesting fact: Though the word “eclair” means “flash of lightning” in French, nobody seems to know exactly why this pastry was named after that meteorological event. More coverage of Francisco Migoya’s desserts on DessertBuzz. Dominique Ansel Bakery is located on 189 Spring Street (Sullivan). Their website is here More coverage of DAB on Dessertbuzz. Epicerie Boulud is located at 1900 Broadway (64 St.). Their website is here. Dessert Club Chikalicious is located on 204 East 10th Street (at 2nd Ave). Their website is here. More coverage of Chikalicious is here. The eclair I had at Dominique Ansel’s Bakery was stodgy and tasted old like it had been made the day before. I was not happy as I had spent a fair amount of money. Eclairs should be a joy to eat. These pictures made my mouth water! all four are certainly upgrades from the Dunkin Donuts eclairs of my youth. 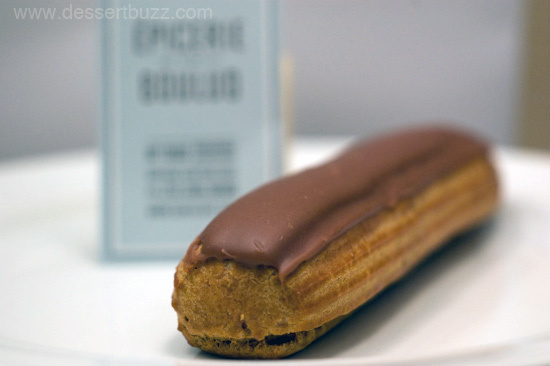 Dessertbuzz » Blog Archive » Epicerie Boulud: is this the best bakery north of 14 Street?